The Reference Collection provides a variety of informational sources in many subject areas, which can provide direct information and/or lead you to other sources of information. The Special Collections preserves unique, rare and special historical materials with primary emphasis on the Three Affiliated Tribes: Mandan, Hidatsa, and Arikara and the Fort Berthold Indian Reservation. Also included are general reference materials concerning Native America. This collection is housed in the southwest corner of the Library and is not a circulating collection. Adult New Reader Collection has extensive materials for adults learning to read and their tutors. This collection, which was begun in 1987 with federal grant money, serves as the resource center for literacy programs throughout the Fort Berthold Indian Reservation. Periodical collection of over 200 periodical titles. Periodicals are sometimes referred to as "serials" and usually published daily, weekly, monthly and quarterly. Periodicals can be very useful when looking for currant information, or information on a new topic. Periodicals include: professional journals, magazines, bulletins, newspapers, and newsletters . Periodicals are published in paper, microform or electronic format. 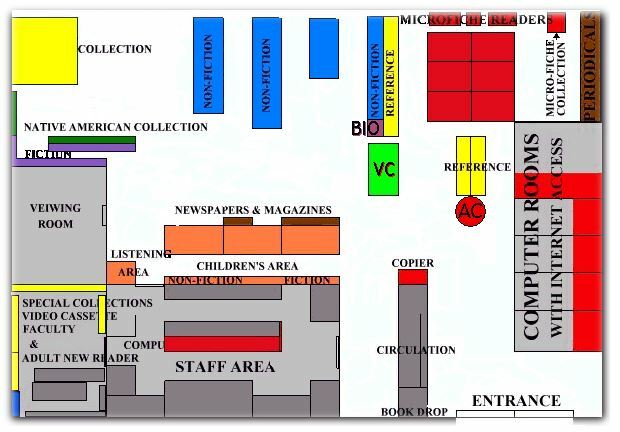 A Newspaper Reading Area is provided with current issues of all periodicals. including national and statewide newspapers. Materials designated as PER are hard copy materials stored in the Periodical stacks at the northeast corner of the library. The FICHE collection is comprised of thousands of publications in a reduced physical format called microform. These include microfilm, microfiche, micro card and microprint. Microform readers and reader/printers are available for use next to the Periodical stacks at the northeast corner of the library.